In just over a year’s time, health economists from around the world will gather in Basel, Switzerland for iHEA’s 13th World Congress on Health Economics. Plans are well underway for the congress, and more and more information will be posted on the congress website over the next weeks and months, with abstract submissions opening in September 2018. More details on these two calls are provided below. Highlights from the 2018 Member Survey were provided in the April newsletter. The full report on the survey findings is now available for download by members. The survey is not a once-off opportunity for inputs from members. We welcome feedback and ideas from our members at any stage, and have set up a SocialLink forum for this purpose. Please send us your suggestions on specific actions that could be taken to better meet members’ needs. In a counterfactual world without any health economists, would progress towards better human health have been faster? There are haters who see health economists as the appointed sayers of “no”. In their version, health is a normal good, people want to buy its means of production and health economists’ concerns with efficiency and equity are a brake on progress. Scarcity-agnosia is good politics and good posturing. How can we help politicians do the harder work of leading people to make necessary hard choices? There is no shortage of health economics applied research that was never considered or considered and ignored by policy-makers. The latter problem is one we have come to terms with. There are extra-welfarist other criteria that we can live with. The former problem where scarce HE research resources have been devoted, but dissemination failed is one that should concern all of us. Squandered HE science is more than a waste of talent, time, and effort. From our professional perspective, we often watch helplessly as policy-makers benightedly choose a dominated plan that wastes both lives and money. The professional training of most health economists does not include shepherding of the policy process. Furthermore, the incentive systems of many economists do not reward effort spent to disseminate and implement findings. 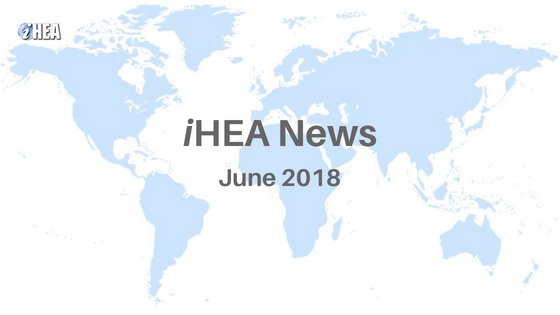 The professional development subcommittee of iHEA recently met to prioritize activities for 2018/19 and helping our work reach policy-makers is definitely a priority. One thing our association and our new SIGs can do is share success stories where health economics research did guide policy. This newsletter can be a great vehicle for notes from the field. If you have seen HE research findings become policy, we would love to hear how it happened. The publication deadline for this newsletter is the 25th of each month and 400 word letters that describe success factors that led HE research to become policy are incredibly welcome. Send your submissions directly to me on iHEA’s Social Link. Pre-congress sessions will take place on Saturday 13th July and Sunday 14th July 2019 at the University of Basel campus in the rooms where the congress will be held. The sessions provide an opportunity to take advantage of health economists coming together from around the world. These sessions are organized and coordinated by the person or organization submitting the proposal, after review by iHEA and the Local Organizing Committee. Sessions may be open or closed depending on the nature of the meeting, but the majority will be open for congress delegates to join. All rooms will have lecture theatre style seating and are equipped with a computer, projector and screen, as well as a whiteboard or chalkboard. Rooms with a range of seating capacity are available and sessions can be scheduled for 2 hours, half day, or full day. The cost to session organizers is as presented below. Two-day sessions are also possible; the cost is double that for a single day. Mid-morning and afternoon beverages will be provided for all pre-congress session participants; lunch is only included for delegates attending full day sessions. These prices are based on the custodial, IT support and catering costs associated with holding these sessions. Any surplus generated from the pre-congress sessions will be used to assist in covering the costs of the core congress and to keep registration fees for the congress as low as possible. iHEA encourages pre-congress session organizers to seek sponsorship to cover the costs of their session to facilitate access to these sessions, particularly for congress delegates with limited financial resources such as delegates from low- and middle-income countries, students and early career researchers. Sponsors of pre-congress sessions will be listed on the congress website, electronic program/mobile app and acknowledged in the session. However, organizers may charge a cost-recovery fee to those who register for their pre-congress session if they so choose. Overviews of accepted sessions will be listed on the congress website, included in informational emails sent to congress participants and the congress program. Session organizers are encouraged to advertise their session through other websites, and listservs. Congress delegates will have an opportunity to register for these sessions in advance. iHEA is currently seeking nominations for experts in Health Economics to serve on the Scientific Committee (SC) for the 2019 iHEA Congress to be held in Basel. While some of the members from the Boston SC will be returning for Basel, the plan is to have a mixture of members with varying tenures to ensure continuity in the operations of the SC while providing opportunities for all members to participate and contribute to the success of the iHEA Congresses. Program Chairs will normally serve for two consecutive Congresses while Review Panel members three Congresses. The iHEA Board would like to especially encourage mid-career researchers to self-nominate for the SC and final decisions on SC membership will need to accommodate gender and geographic diversity as well as providing adequate coverage of the broad fields. Self-nominations should be submitted online here. Please note: If you served on the Scientific Committee for the Boston congress, you should not complete this form; you will be contacted directly to find out if you are willing to continue serving on the SC. Nominations for Program Chairs close on 16 July 2018 and nominations for the Review Panel close on 1 October 2018. · Draft London Food Strategy: The London Food Strategy is expected to set out priorities and commitments for food. Leading the working group responding to this consultation is Dr Grace Hampson (OHE). · Australian New Parliamentary Inquiry into Obesity: This inquiry will look at the causes of rising levels of obese and overweight people in Australia and how the issue affects children. The economic burden of the health concern and the effectiveness of existing programs to improve diets and tackle childhood obesity will also come under the microscope. The committee will scrutinise the role of the food industry in contributing to poor diets, with its report due in August. Leading the working group responding to this inquiry is Dr Victoria Brown (Deakin University). If interested in joining either of these working groups then please contact: Emma Frew (e.frew@bham.ac.uk). At the main iHEA congress meeting in Boston, July 2017, the EOSIG contributed a special organised session titled ‘What economics can do to help inform policy to tackle obesity’. A perspective article summarising the discussion during this session has now been published at: https://onlinelibrary.wiley.com/doi/abs/10.1002/oby.22211. For anyone working within obesity research who would like to find out more about the EOSIG then please come and join us at the EuHEA meeting in Masstricht, July 12-14. There will be an informal meeting on Thursday 12th July at 6pm at the Café Ipanema (located within walking distance from the MECC. Address details: Avenue Ceramique 250 6221 KX Maastricht). It would be a pleasure to meet everyone in person who are current EOSIG members and to invite anyone with an interest in obesity who might be considering joining the EOSIG. For catering purposes if you could let Emma Frew (e.frew@bham.ac.uk) know if you plan to join this meeting that would be appreciated – thanks. When the Journal of Pain and Symptom Management (JPSM) dedicated a 2009 edition to the challenges and priorities for health economics research (https://www.sciencedirect.com/journal/journal-of-pain-and-symptom-management/vol/38/issue/1), the results indicated a field at a highly formative stage. Optimal approaches to both measuring costs and evaluating outcomes were unclear. While palliative care access was growing internationally, unmet need was multiplicatively larger than existing capacity and future needs would be greater still. Policy advocates were operating without a serious evidence base. Future research priorities amounted to pretty much anything you could think of. At last month’s European Association of Palliative Care Research Congress in Bern (http://www.eapcnet.eu/research2018/), the signs of a decade’s development for the field were unmissable. Economics was afforded two dedicated sessions in a programme that emphasised quality over quantity with a small number of large-room events. At a special themed session with three invited speakers, Professor Charles Normand (Trinity College Dublin), a founding member of our iHEA SIG and one of the first health economists to work in palliative care, provided an overview of the challenges facing the field. Referencing Kahneman and Tversky, he reminded us that while QALY approaches treat time as additive, people often do not. This so-called ‘QALY problem’ is potentially a major problem in a one-off event such as the end-of-life phase and Charles considers this riddle must be solved if economic evaluation is to assess the value of palliative care interventions fully and fairly (https://www.sciencedirect.com/science/article/pii/S0885392409005041). Dr Konrad Fassbender (University of Alberta), another early adopter of economics in palliative care, presented on informal caregiving. Economic evaluation from the health system perspective is especially limited for people with serious and complex medical illness, where studies routinely show the cost of informal care to be between 50% and 100% of formal care costs. Konrad highlighted the scope of work yet to be done in this area, starting with the need for a consensus definition of informal care and how it is measured. Beyond this, there is a critical need for a research agenda that promotes innovative approaches to these challenges. In a field whose over-reliance on routinely collected data is well known, only through primary research that recruits, retains and engages caregivers can the appropriate supports and policies be understood. Finally, Kristof Faes, a PhD candidate in health economics at the University of Gent, addressed the challenges of using routinely collected data from a different perspective. Kristof and colleagues at the Belgian End of Life Research Group, have executed the innovative linkage of multiple big data sets to leverage insights on both costs and quality of experience among decedents at the population level (https://bmcpalliatcare.biomedcentral.com/articles/10.1186/s12904-016-0159-7). This was the third year in four that EAPC has afforded economics a special themed session, and both the size and sophistication of audience interaction has appreciated markedly in this time. The second economics session entailed six peer-reviewed presentations variously addressing an RCT on advanced care planning in the Netherlands (Anouk Overbeek), novel approaches to evaluating readmissions using routine data for an intervention with high mortality (J. Brian Cassel), end-of-life experience in The Irish Longitudinal study on Ageing (TILDA; Peter May), ongoing efforts to map the Palliative care Outcome Scale (POS) for economic evaluation (Irene Higginson on behalf of Mendy Dzingina), a micro-costing exercise in a Swiss hospital (Monika Hagemann), and results from the Belgian big data exercise (Kristof Faes). The diversity of these presentations demonstrated an energy to addressing the field’s myriad challenges. Yet for all the progress made over the last 10 years, future priorities for the field remain very open. Costing methods, particularly in informal care, are rudimentary. With respect to outcomes there have been more papers theorizing the ‘QALY problem’ than evaluating QALYs with palliative care interventions empirically. Big data methods are at an early stage and retain critical limitations, notably where restricted to retrospective recruitment of decedents. Both evaluating treatment effects across the disease trajectory and projecting future needs and costs require modelling expertise that are noticeable by their absence. More than anything this seems an issue of capacity. Each EAPC session in Bern had two hosts, three of whom contributed to that 2009 JPSM special edition and all four of whom presented in the session that they did not host. The number of people who attend both EAPC (or a similar event) and the iHEA Congress can be counted on one hand. Research activity in low- and middle-income countries appears particularly low. If we are to reduce the high levels of documented suffering at end of life by improving care and reconfiguring health systems, palliative needs more economics. That means more economists. My colleague Nikki McCaffrey and I invite all iHEA colleagues to join our SIG as we seek to address profound policy questions and methodological riddles in this field. Members of the THE SIG (Allen Goodman, Maia Platt, and Jill Herndon) organized and facilitated a half-day pre-conference workshop on Teaching Health Economics at the 7th Conference of the American Society of Health Economists in Atlanta, Georgia on Sunday June 10, 2018. The first half of the workshop included presentations by Maia Platt (University of Detroit Mercy), Neil Meredith (West Texas A & M), and Sam Richardson (Boston College) on incorporating health economics into curricula and interactive demonstrations of applied learning activities. Maia spoke about creating health economics course competencies for nursing students. Neil shared his experience in teaching through distance-learning platforms. Sam demonstrated exciting interactive examples of using Gapminder software. The second half of the workshop, led by Jill Boylston Herndon (University of Florida), engaged 40+ participants in peer-learning small- and large-group discussions during which they shared examples of active learning activities that they use in their courses and brainstormed strategies for overcoming challenges to implementing new active learning activities. There was lively discussion, with a wealth of ideas shared for successfully developing and implementing active learning activities in health economics courses in a range of curricular programs. Thank you to all of the participants for sharing their terrific ideas! The THE SIG invites iHEA members to join and to become part of our peer teaching network. Latin America has made great progress towards improving the health of its population, as evidenced in the sharp drop in child mortality and in the sustained increase in life expectancy observed in the last decades. However, several health-related problems remain unsolved, such as child malnutrition and the high incidence of infectious diseases, like dengue and malaria. Many countries have recently introduced reforms aimed at strengthening health systems and universalizing access to health care, but still a considerable number of individuals either remain uninsured or have access to low quality services. At the same time, demographic and epidemiological changes are increasing the incidence of chronic diseases, challenging the sustainability of health systems in the region. In 2017, the Research Department of CAF-Development Bank of Latin America launched a call for research projects on key topics related to health and social inclusion in Latin America aiming to contribute to the public policy debate to strengthen health systems. In this note we summarize the key findings of the winning projects. Early childhood development programs are crucial to improve health outcomes and foster social inclusion. The first years of life are the pillar for physical, cognitive and non-cognitive development and ample evidence indicates that events during this period have life-long consequences in many aspects of individual wellbeing. In this regard, Clarke, Cortés and Vergara (2018) study the impact of Chile’s flagship early life health and social welfare program, Chile Crece Contigo (CCC) on neonatal health outcomes. CCC offers a basket of medical and social services, information and supplies to all expectant mothers enrolled in the public health system, as well as their children once they are born, plus additional benefits to families classified as part of the 60% most vulnerable in the country. The study finds that CCC had a positive effect on birth weight, and that it reduced the rate of fetal death and increased gestational length. Further results indicate that this policy is both equity enhancing as well as efficient when compared with other early childhood policies. Quality of health care services is another relevant dimension to improve health outcomes in the region. Fleitas (2018) assess the effects of a change in the regulation of consumers’ mobility across health insurance plans in the Uruguayan public health system, which induced higher competition in the market and better incentives to health care providers to increase quality by incorporating higher quality inputs. The study shows that the change in the regulation increased the relative demand for high ability physicians but, contrary to the policy objective and due to the inelastic supply of these physicians, the resulting effect was higher wages but not a substantial increase in the total quality in the system. Health care spending is growing fast in many countries and cost containment measures will be required to guarantee the sustainability of the systems. A key item is pharmaceutical spending, which represents up to 25% of total health spending in some countries. Increased penetration of generic drugs has been one of the major sources of health care cost savings in developed countries in recent decades; however, generic penetration has developed at a slower pace in less developed countries partly due to weak quality regulations. Atal, Cuesta and Saethre (2018) study the impact of bioequivalence requirements for generic drugs in Chile on market outcomes, and their results point towards potential unintended effects of quality regulation policies. Specifically, the policy increased the number of drugs which obtained the quality certification mandated by the regulation but due to the increased costs of complying with it many firms were induced to leave the market. This translated into a reduction in the total number of drugs in the market, higher prices, and no significant effects on the market share of generics. Population ageing and policies to improve adult health will be a relevant issue in the years to come in light of the recent demographic and epidemiological transitions. Miglino et al. (2018) assess the effects of a Chilean basic pension program targeting vulnerable adults aged 65 and above on adult health. Their findings suggest that the program improved beneficiaries’ health in many dimensions: four years after applying for the benefit, recipients were less likely to die than non-recipients and less likely to suffer a medical episode. Improvements in health status were driven by lower mortality from respiratory and circulatory diseases. References - All papers are part of CAF Working Paper Series and available here: https://www.caf.com/en/topics/r/research-for-development/publications/. Atal, J.P., Cuesta, J.I., & Saethre, M. (2018). Quality Regulation and Competition: Evidence from Pharmaceutical Markets. Working paper N° 2018/10. CAF Working Paper Series. Clarke, D., Cortés, G., & Vergara, D. (2018). Growing Together: Assessing Equity and Efficiency in an Early-Life Health Program in Chile. Working paper N° 2018/01 CAF Working Paper Series. Fleitas, S. (2018). Who benefits when inertia is reduced? Competition, quality and returns to skill in health care markets. Working paper N° 2018/08. CAF Working Paper Series. Miglino, E., Navarrete, N., Navarrete, G., & Navarrete, P. (2018) The effect of a Basic Pension on Mortality: a Regression Discontinuity Design. Working paper N° 2018/11. CAF Working Paper Series. If you have anything you would like to contribute to future newsletters, please email us at ihea@healtheconomics.org.